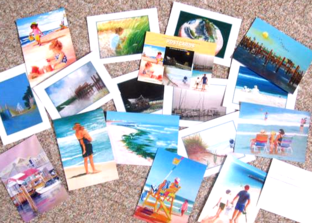 Each postcard depicts a different painting of mine of a scene at the New Jersey shore. 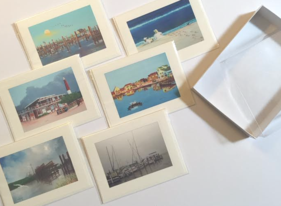 Each 5" x 7" postcard is printed on a heavy stock and is suitable for mailing, but also is a standard size for framing. At Art By Millar, I take care to provide our customers high quality products personalized for their unique needs. I am available to take your order 24 hours a day, 7 days a week. For canvas prints, an 8" x 10" mat with a 5" x 7" print of any painting on this website. Museum etched fine paper prints have a larger 6" x 9" image centered on 8" x 10" heavy paper stock. Each print is complete with backer board, and enclosed in a protective re-sealable bag. Faithfully reproduced in full color on canvas or museum etched paper (artist will recommend which, based on the subject matter), each print is quite suitable for framing. Signed by the artist on the back. The products shown on this website are available directly from the artist (payment by PayPal). For pricing, general correspondence, comments and inquiries, please contact Dennis Millar by email (dfmillar@gmail.com). Original painting matting and framing are available for pickup orders only. Packing (in special envelopes or boxes) & Shipping for prints will be at cost + 25% (US Post Office Priority Mail or UPS Ground). A copy of the receipts will be provided. When emailing your order, please include Name, Address & Phone Number. Also, indicate the title & quantity of prints you would like to purchase. I will get back to you to confirm your order. P&S for original art, merchandise or oversized prints may vary. Each note card depicts a painting of mine. They are sold in a box of 6 - all the same or mix & match - you decide. Each note card is individually wrapped with a blank envelope, and 6 are placed in a stationery box.​ Makes a great gift ! Copyright Dennis F. Millar, 2018. All rights reserved.